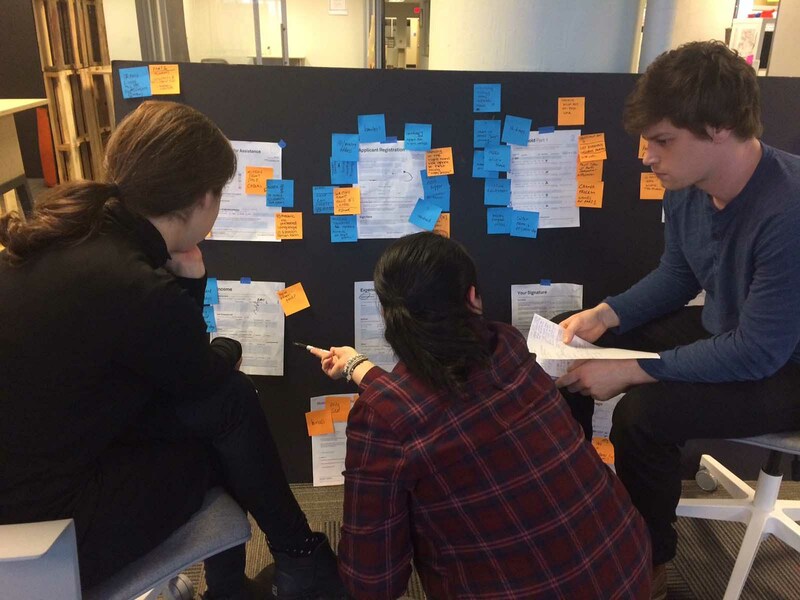 The team from Civilla, a Detroit design studio, discusses feedback from caseworkers and residents to simplify Michigan's public benefits form. (Photo by Michael Brennan). With only a few minutes left to fill out a state application for government assistance, Terry Beurer was struggling. Every page was a thicket of eligibility requirements and redundant questions about his household expenses and income. Time ran out. He was on page 8. Of 42. Luckily for Beurer, it was only a test. He and some colleagues at the Michigan Department of Health and Human Services were filling out the application with an eye toward understanding -- and eliminating -- the hurdles that prevent many Michigan residents from finishing the form. Working with a Detroit design studio, Civilla, the state health agency is applying the principles of plain language, an approach proponents say can prune bureaucracy and help ordinary residents better understand the workings of government. The effort, while only a pilot for now, follows the lead of other states which report more efficiency and significant cost savings after adopting a government-wide, plain-language program. By all accounts, the dreaded assistance form was a good place to start. Beurer and colleagues tried filling out the application more than a year ago to experience what more than a million Michiganders a year go through when they apply for public assistance to pay for food, child care, emergency relief and other expenses. Simplifying government claptrap: Here is an example of how one state department is trying to redesign complex government document into a simpler format. On the left is a page from the state health department’s application for public benefits. On the right is a shorter version of the same page. What they confronted is the longest public-assistance application in the nation -- more than 18,000 words and over a thousand questions. While residents do not face the 20-minute clock that ran out on Beurer, they do wrestle with everyday time constraints, and many are unable to finish the daunting form. It’s one reason Michigan residents leave unclaimed more than $1 billion a year in federal funds allocated for assistance programs, according to Civilla. With Civilla’s help, Beurer said MDHHS has eliminated redundant questions, provided clearer instructions and trimmed the 42-page form to 18 pages, and with fewer words per page. In January the department introduced the shorter form at its Hamtramck and Eaton County field offices. The plan is to further improve the form with lessons learned during the pilot phase and roll it out statewide at the start of 2018. It’s too early to tell if the simplified form will save the state money by reducing staff time, printing or other costs, though other states report savings. Financial savings aside, “government has a moral obligation to communicate with its citizens in a way that they can understand,” said Joe Kimble, a distinguished professor emeritus at Western Michigan University’s Cooley Law School and a leading advocate for plain language in government documents. Fulfilling that obligation doesn’t just mean avoiding jargon or swapping “utilize” for “use,” Kimble said. Plain language includes a range of guidelines and techniques, such as writing short sentences in an active voice, using bullet points, or breaking up text with subheadings. “A communication is in plain language if its wording, structure, and design are so clear that the intended readers can readily find what they need, understand it, and use it,” according to the Virginia-based Center for Plain Language, a group Kimble co-founded in 2003 that advocates for plain language legislation and gives awards for clear writing. Michigan would certainly benefit from simplifying government writing, said Mark Cooney, who heads the Cooley research and writing department formerly chaired by Kimble. As two “woefully typical” examples, Cooney cites the state’s medical marijuana statute and Emergency Medical Services Act, and has suggested rewrites in the Michigan Bar Journal’s plain language column— the longest-running column on legal writing anywhere, which Kimble has edited since 1988. Michigan has made efforts over the years to craft documents that ordinary civilians can understand. But, Lansing being Lansing, bureaucratic jargon still tends to creep in. Kimble said the effort needs total commitment. Kimble points to Washington and Minnesota as two states that have made a fierce commitment to plain language and seen real benefits. Oregon and Florida also created programs to simply government documents. In 2005, Gov. Christine Gregoire of Washington signed an executive order instructing all state agencies to adopt plain language principles and practices. She noted in the order that three state agencies had already found measurable success with their own “plain talk” programs. For example, the number of businesses paying an often-overlooked use tax tripled after Washington’s Department of Revenue rewrote a letter to business owners in 2003 about the tax, netting the state $800,000 more than expected in use-tax revenue. That amounted to about a dollar for every penny the state spent producing the simple letter. By 2008, 35 agencies in Washington had launched plain-talk programs, trained more than 5,000 state employees and rewritten a thousand letters and 225 other forms. In at least a few cases, the work paid off with improved efficiency and substantial savings. The Washington Department of Social and Health Services reported savings of $25,000 a year in postage and paper alone when it simplified its communication with government benefit recipients by merging 12 separate form letters into one. Phone lines in the Department of Labor and Industries were clogged by Washington residents confused by a letter they received after requesting public records. In 2009 the agency developed clearer instructions and saw a 95 percent drop in call volume. With less time spent answering phones, the department cut in half the time it took to process records requests. That allowed the state to save $110,000 that had been budgeted to hire two staffers who were no longer needed, even when the number of public records requests tripled the next year. In Minnesota, Gov. Mark Dayton followed Gregoire’s lead with a 2014 executive order that required the governor’s office and all state agencies to use plain language, building on a successful program launched by the state’s Department of Revenue. Since then, roughly 2,800 people across Minnesota’s government have received plain language training, said Melissa Donndelinger, a communications specialist in the revenue department. The department recently consolidated 35 versions of a tax form into a single document, saving 60,000 sheets of paper per year. Staff also credit the initiative with increasing the portion of eligible taxpayers who receive their tax refund via direct deposit from 71 percent to 75 percent, again saving the state money. At the federal level, President Barack Obama signed the Plain Writing Act, in 2010, which requires “clear government communication that the public can understand and use,” and issued a pair of executive orders related to plain language in regulations. In January, U.S. Rep. Blaine Luetkemeyer, a Missouri Republican, introduced a bill that would require federal agencies to issue plain-language summaries of proposed regulations. Still, the status quo is not without its champions. “I can tell you I think plain language is an abomination that has caused a lot of trouble,” said Jack Stark, a retired attorney who wrote tax law for the State of Wisconsin for 19 years. Stark and Kimble have sparred in professional journals. There’s a lot of Kimble to read. He pushes back on the notion that government forms have to be wordy or complex to convey the intended nuance. He said law professors, practicing attorneys and government leaders are increasingly recognizing that simple writing can be more precise than legalese, and elegant in its clarity -- that in the right hands, it can be more like the language of Abraham Lincoln or Mark Twain. So it is that the process of simplifying Michigan’s public assistance form won’t happen quickly. Beurer told Bridge it was too early to draw conclusions from the pilot, though he said signs are encouraging. Residents using the shorter application are finishing in about 20 minutes, down from 45 minutes. And more are filling out the full form, and not giving up part way through. They tell the department staff that the application also feels less...threatening. It is great that Michigan employees are looking at this. What is not so great is that there was mention of an outside agency most likely hired to do job that anyone with common sense and an ounce of brains could do in very little time and at no cost. Find an internal employee and get the job done simply and cheaply. “The legal profession has erected an impenetrable wall between people and the documents that govern their own lives and businesses.” Bingo! Full employment for attorneys. Here's an idea - have a simple form for the bulk of applicants who do not have complicated situations, sort of like the Federal 1040EZ. If things are more complicated, check boxes could steer you to a supplemental form(s) to address those trickier issues. ...(or)... "call this number," and someone can walk you through the application. This might make it possible to screen out what may be the bulk of applicants, leaving time and resources to help the more difficult cases. In my youth I was taught "KISS", (keep it simple stupid), whenever I tended to get complicated. Now as a retiree I am frequently frustrated and annoyed trying to deal with all the electronics that cause me to do things I don't want to do, and will not let me do what I want to do. I applaud the plain language movement and encourage everyone to KISS. "It’s one reason Michigan residents leave unclaimed more than $1 billion a year in federal funds allocated for assistance programs, "
Sorry to seem cold, but why should we care if there is a quick and easy path to federal (taxpayer) funds? Simplify it even more by elimination of federal interference in such things. Government is NOT charity. It is force. Every dollar not handed out to those either unable, or unwilling to take it (or earn it) is a dollar not pulled from the pocket of a taxpayer at the end of a gun. Government attempts at charity is theft. Private giving is far more efficient than the 80 pages and the supportive bureaucracy it takes to analyze those pages. Of course its harder to give (though we still do) when the taxman has emptied the purse first. Jerry, you are exactly correct. I was too focused on the people in the picture seeming to make a big job out of the simplification process to look beyond and ask why even have this program. When we have to borrow 40 cents of every dollar we spend, it is time to consider, for our grandchildrens' sake, whether we even need to spend that dollar. People did seem to survive before 1900 without any of these government programs. It's a valid argument that I'm honestly surprised Mr. McGlashen failed to acknowledge in this piece. More than the language use [there will always be lawyers writing and interpreting the laws], the structure needs to be changed. Every law should have a specific purpose, a listing of unintended consequences, the expected results the law is to deliver, metrics to measure the results, 'milestones' to verify the effectiveness of the law, third party verification assessment of the law and associated programs/practices [integrating transparency into the programs], a regular reporting schedule by the agency responsible for implementing/delivering the expected results, a regular review [public] verifying the laws results and process to making appropriate adjustments. ...and not one example, very poor article. As some people are "deniers" of global warming in the face of solid scientific proof of it, so, too, is Mr. Stark a "denier" of the value of plain writing. He proffers nothing more than bare opinion that is contrary to factual data that, as he admits in this article, he refuses even to read. In claiming that plain writing advocates assume that all writing is the same and then calling that assumption "moronic," Mr. Stark sets up a logical fallacy. No writing is "the same." Good writers know that good writing is the kind that best conveys to the reader what the writer intends to convey. Plain writing advocates agree that legal terms of art developed and accepted over the centuries have a place in legal writing. But they also know, and can prove, that plain writing in legal documents more clearly conveys the concepts that the drafter intends, makes the words easier to understand, reduces risk by minimizing ambiguities that give rise to disputes, and saves governments, corporations, and citizens substantial time and sums of money with no loss of confidence in the meaning of the documents. Could it be Bridge has the beginning of a series of articles here? If Bridge were interested, they might invite people to offer articles that present different aspects of laws/regulations/policies/rules legalities] in today's context. It could help us see across what seems to be a widening gap between those who develop and apply the legalities and the ones that are living within those legalities. It should be interesting to have the why and how , the purpose, of the legalities, the practicalities of implementation, the realities of application, how the writer and regulated diverge, etc., and hear the different perspectives on each element. Writing clearly and concisely is very hard work. Guess why we don't see more of it? Plain language is great. But how about plain common sense. Clients are required to do the assistance application on line, however the program is set up so that if they make a mistake, they cannot go back and correct it!!!!! !